Who's your favorite basketball duo? Magic and Kareem, right? Oh, Stockton and Malone? 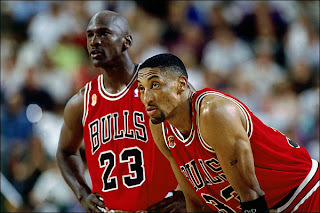 Or is it Jordan and Pippen? Cool. Good. Fine. All those work. For my choice, I gotta go with Bryan and Caleb. Over the past few months, these two guys have been assisting each other in producing weekly entries on our site as part of their independent literature course with me. They've produced an impressive body of work. One big difference between this independent study course and my "regular" courses is that my regular courses do not require so much writing, editing, reading, reviewing of footage and coverage, and meeting with the professor to discuss class materials. We've talked about KD, Rondo, KG signifying on Melo, advanced stats, nerds, mind work, and more. Bryan reads and edits all of Caleb's entries before they are published, and Caleb does the same things with Bryan's entries. It's like Stockton to Malone, or Kareem receiving yet another no-look from Magic. Students often dislike group work, but I haven't heard any complaints from Bryan and Caleb. In fact, they regularly mention the value of working as a small team like this. I'll try to replicate some of the collaborative nature of their project in my other courses moving forward. I also want to figure out more of what it means that we've transformed a popular ghost curriculum like knowledge of basketball, especially the NBA, into the blueprint for a literature course. In the meantime, you can keep making up your mind about your favorite duo. KD and Westbrook? LeBron and D-Wade? For me, you already know where I'm placing my bets.